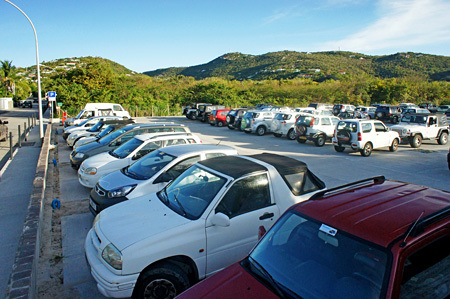 For those of you who have never been to St. Barts and/or those of you who haven’t been back here this season, the parking at St. Jean Beach has changed. Everyone used to have to scramble to find parking (there wasn’t any) so people just parked along the curb by pulling onto the sidewalk, putting the right front and rear tires up there and letting the left tires stay on the road. Things really got hairy over the holiday period when the island is full and the St. Bart children are on vacation because everyone wants to go to the beach. So, anarchy set in for some people who simply decided to park on the sidewalk on the other side of the street making it impossible for 2 cars to get by. Throw in a taxi driver who doesn’t care about blocking traffic and we had gridlock. At times, the Collectivité (aka The Com) would make that stretch of road one way which helped a lot but that was just a temporary solution. No more! The Com decided to build a parking lot across the street from the runway end of St. Jean Beach. 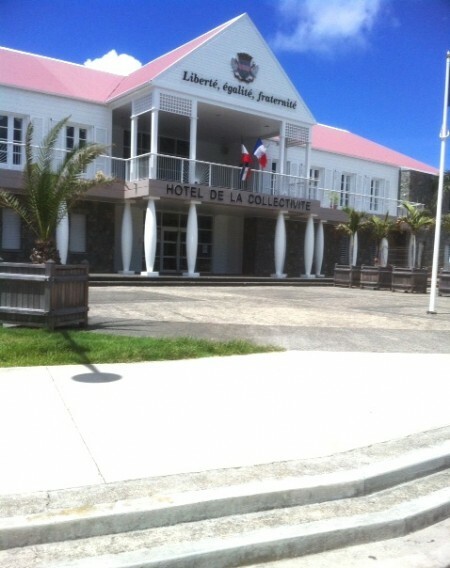 Environmentalists were disappointed because they had to construct it on virgin land but St. Jean Beach lovers are grateful to have it. Note the photo also shows the posts that have been put up on the sidewalk just in case those anarchists don’t get the message. 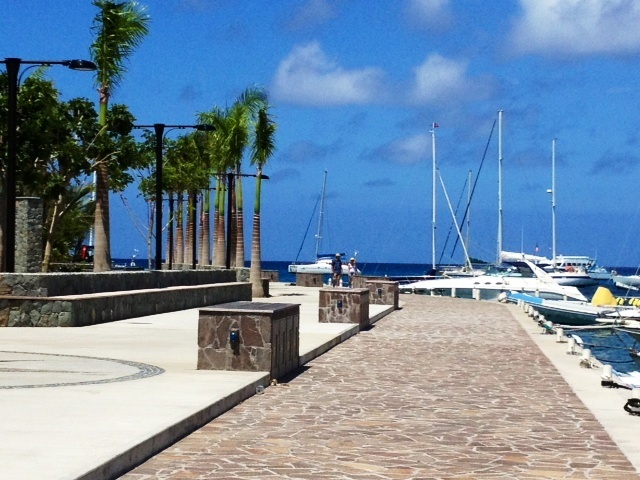 Another concrete area was built on the water near the Hôtel de la Collectivité (aka City Hall). It’s a beautiful new extension of the quai on that side of the harbor thus creating more places where the local people can dock their boats. Whatever company won the landscaping contract must have had a huge budget because the area has towering palm trees and flowering bushes. 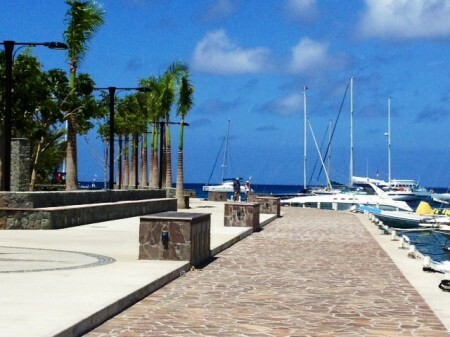 There is a compass rose made up of small stones and it lies in front of built-in benches where you can sit and enjoy the view of the harbor; there’s a wall of stones that holds a sign welcoming people to St. Barthélemy. My morning walks that take me over there make exercising a bit more tolerable because the scenery is so appealing. I hope that you will take the time to go there the next time you are in St. Barts. 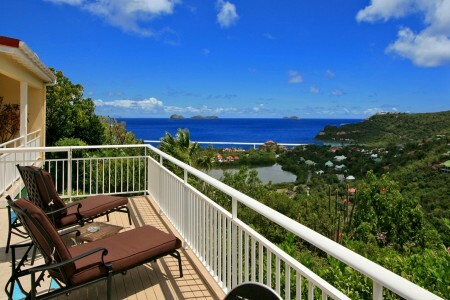 One more bit of news regarding one of our villas is the “new look” at Villa Bonjour. The owner has made lots of upgrades on the furnishings including new chaises on the terrace and an outdoor sitting area in front of one of the bedrooms. If you love to be centrally located in St. Jean, Villa Bonjour is a great choice for two people and also for two couples because the king en suite bedrooms are located on either end of the villa and are identical. 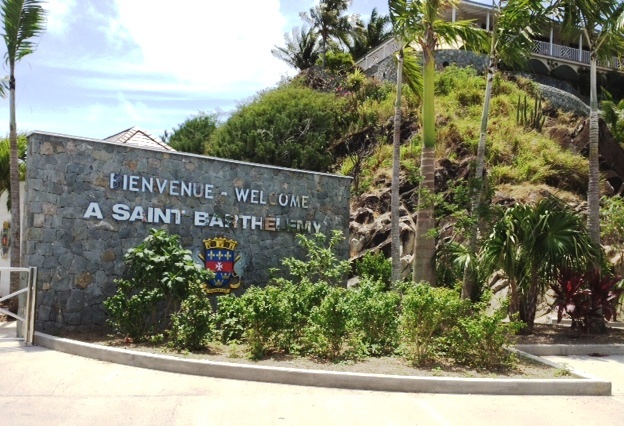 For more information, contact reservations@stbarth.com.